Elana stays warm in the chilly weather with her comfortable coat. Elana displays her sweater and tank top that keep her cozy during class. Elana Eden is a second year who is currently undeclared. Her style fluctuates day by day, but is usually feminine. She describes it as “gamine.” She likes to shop at Buffalo Exchange and finds previously loved goods at thrift stores and flea markets. She particularly likes Buffalo Exchange due to the added benefit of being able to sell her own clothes. She looks to Anna Karina, a French actress, and Mia Farrow for style inspiration. Films also influence her dress. While she is still deciding on a specific career path, she proclaims with absolute certainty, “nothing with hard sciences.” During the weekends, she can be found taking advantage of films offered at UC Berkeley’s Pacific Film Archive. 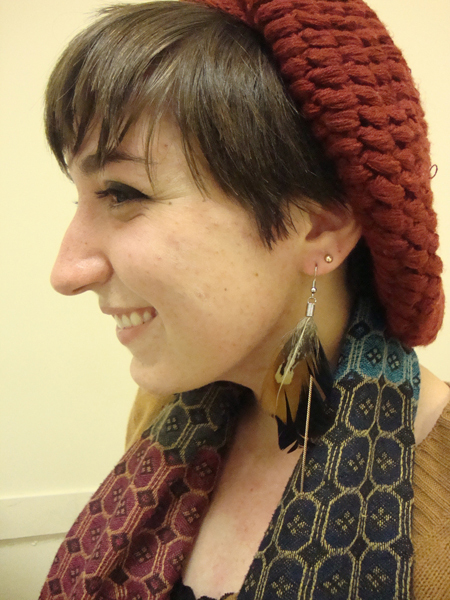 A close-up of Elana’s trendy feather earrings. Her coat is from a thrift store called Out of the Closet. 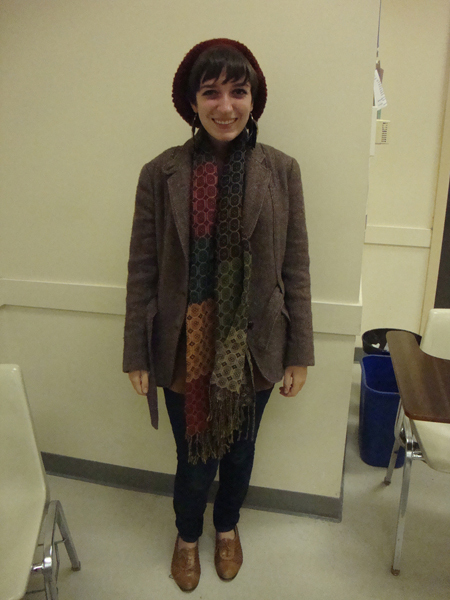 Her hat and scarf are from stores in Jerusalem. Her earrings are from a local store on Telegraph and Dwight. Her tank top and sweater are her mom’s and her jeans are from Forever 21. Her shoes were purchased at a flea market in L.A. held at Fairfax High School.